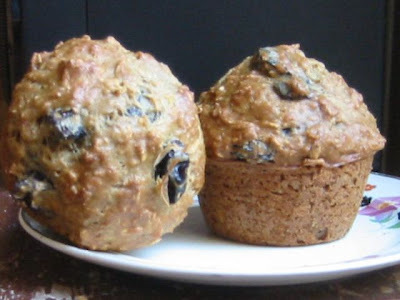 When I put raisins in my favorite oatmeal muffins last time, I found them rather dry. Dry like a town with no cheer. The solution? Get your raisins drunk and send them stumbling into the batter. Rather like making mulled wine -- with the spotlight on the raisins, not the half-drunk cabernet that spent several days on the counter -- I put 1.5 cups of red wine in a little saucepan with 1 cup raisins, 2 sticks of cinnamon, and 3 cloves. I brought it to a simmer and let it sit while I made the batter. For the batter, combine 2 cups flour, 3 cups rolled oats, 2 tsp. baking soda, and 1.5 tsp. salt. In another bowl, mix 3/4 cup brown sugar, 2 eggs, 1 tsp. vanilla, and 2.5 cups whey (or other sour dairy product, like yogurt or buttermilk). Pour the wets into the dries, mix well, and let sit until the oats soak up the moisture. Just before baking, drain the raisins from the wine (pick out the cloves and cinnamon), and fold them into the batter. If your wine is like mine, its raisin-bathing labors will have only improved it. Spoon the batter into greased muffin cups and bake in a 350 degree oven for 25 minutes or till golden on top. Makes 12.